4 doc. 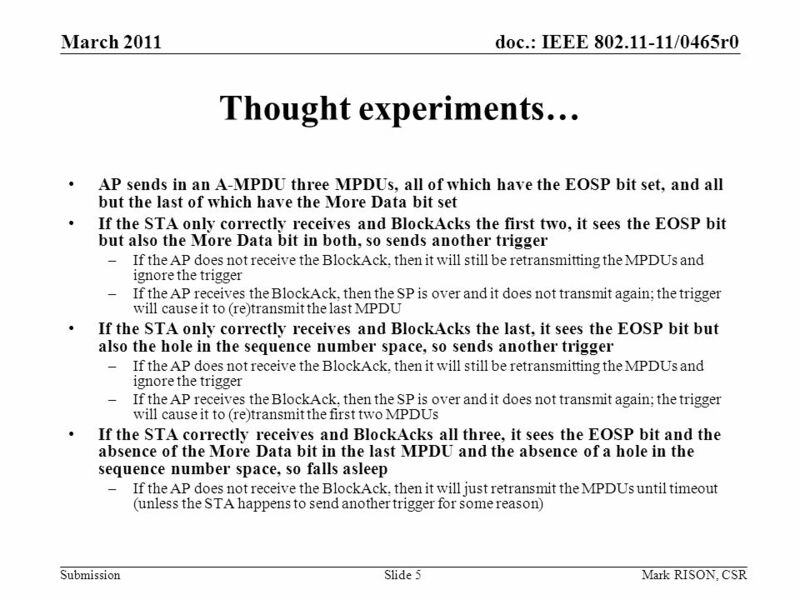 : IEEE 802.11-11/0465r0 Submission March 2011 Mark RISON, CSRSlide 4 Proposed analogous U-APSD operation with A-MPDUs Proposal by analogy with non-A MPDU case: AP sends A-MPDU to STA; all EOSP bits have the same value (see clause 9.12.1); if set and STA correctly receives at least one then: –STA may in principle fall asleep after BlockAcking the A-MPDU Even if not all MPDUs in the A-MPDU were correctly received! 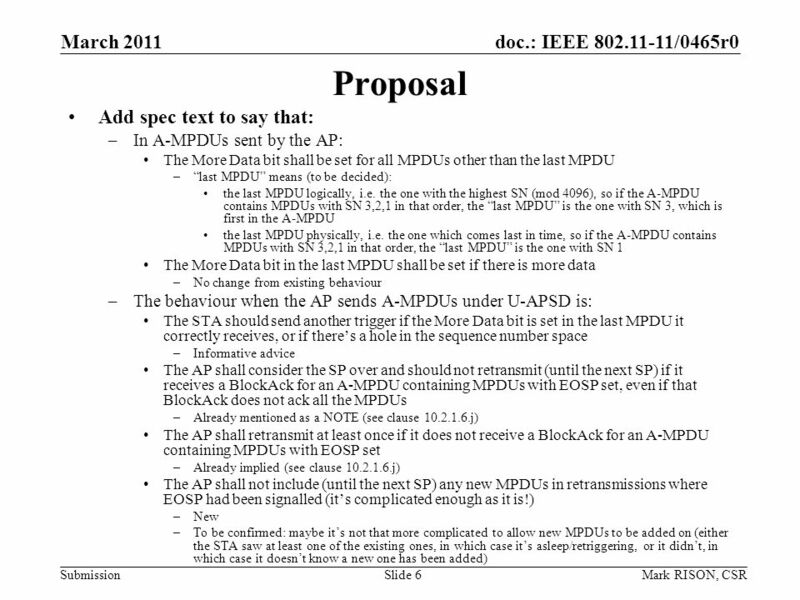 –If the AP gets the BlockAck the SP is over Even if not all MPDUs in the A-MPDU were acked! The AP does not transmit an A-MPDU again (but if it does thats OK) –AP may miss the BlockAck; in this case the AP transmits the A-MPDU again at least once but the STA will not BlockAck the transmission(s) MPDUs might time out, which would be bad for those which the STA has not correctly received –If the More Data bit is set in the last MPDU it correctly receives then STA awakens (or doesnt fall asleep) and sends another trigger AP sets More Data bit to 0 or 1 in the last MPDU per the normal rules AP sets More Data bit to 1 in MPDUs other than the last MPDU. This increases efficiency if the last MPDU transmitted is not correctly received -- otherwise, how would the STA know it needs to send another trigger to get the missing last MPDU? –If there is a hole in the sequence number space then STA awakens (or doesnt fall asleep) and sends another trigger This increases efficiency if an MPDU other than the last MPDU is not correctly received, and the last MPDU has the More Data bit set to 0 -- otherwise, how would the STA know it needs to send another trigger to get the missing non-final MPDU(s)? Download ppt "Doc. 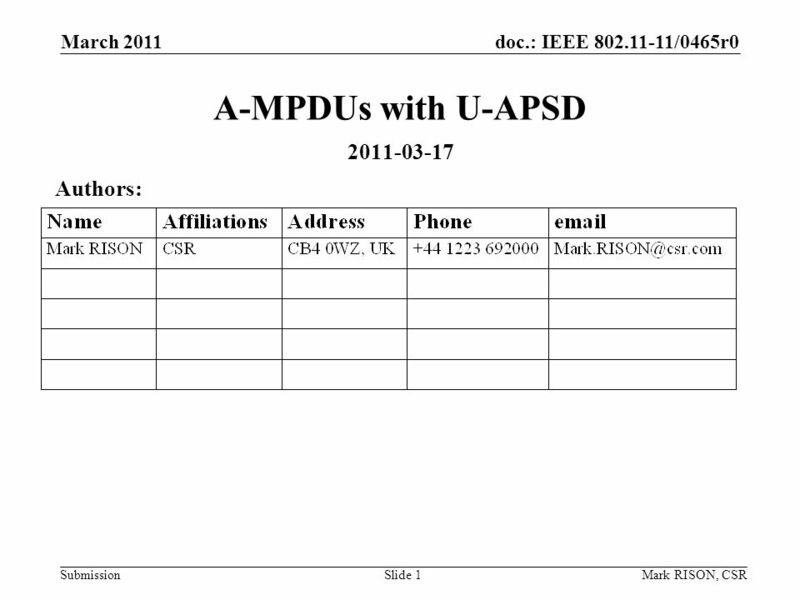 : IEEE 802.11-11/0465r0 Submission March 2011 Mark RISON, CSRSlide 1 A-MPDUs with U-APSD 2011-03-17 Authors:"
Doc. : IEEE /0104r1 SubmissionLiwen Chu Etc.Slide 1 Fragmentation with A-MPDU Date: Authors: Date: Jan, 2012. Doc. : IEEE /0703r0 Submission March 2008 Luke Qian etc, Cisco Systems, IncSlide 1 Issues and Solutions to IEEE n A-MPDU Denial of Service. Doc. : IEEE /0833r3 Submission July 2008 Luke Qian etc, CiscoSlide 1 A Proposed Scaled-down Solution to A- MPDU DoS Related Comments in LB 129. Submission doc. 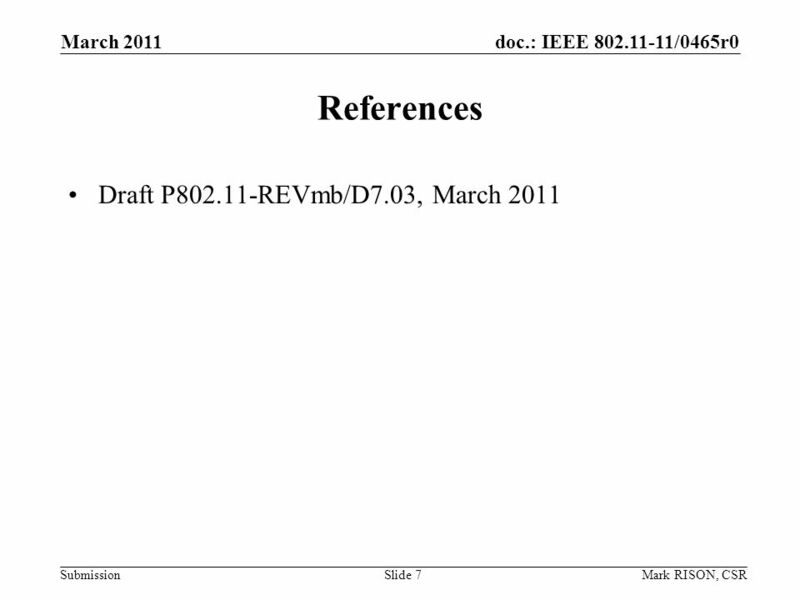 : IEEE /0325r0 March 2012 Slide 1 TIM Enhancement With Group Bits Date: Authors: Zhong-Yi Jin, Nokia. Doc. : IEEE /1355r2 11ah Submission Date: Authors: Nov 2012 James Wang, MediaTek Slide 1. Doc. : IEEE /0295r0 Submission PRAW Follow Up Date: Authors: March 2013. Doc. : IEEE802.11-13/0517r0 May 2013 Submission Slide 1 Authors: Combining Process in Virtual CS Mechanism for 802.11ah Date: 2013-05-06 Lv kaiying, ZTE.